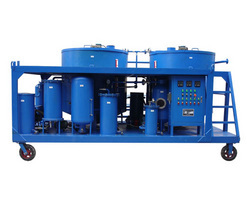 LYE Series Engine Oil Purification Plant is a highly efficient regeneration system, which is designed for recycling seriously deteriorated waste engine oil. The machine can efficiently remove water, gases and other harmful particles, restoring the oil’s original quality and transparency. •The advanced fully-automatic temperature controlling system, liquid-level controlling system, defoaming controlling system, pressure protecting system and excellent equipment can ensure operation of the machine with high performance.